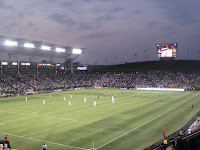 Tonight I headed out to The Home Depot Center to see the LA Galaxy and the famous David Beckham play some futbol. I had never been to a pro soccer game before and it was really cool, although I didn't expect so many accidents and falls, but that made the game even more interesting. 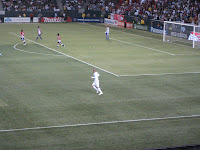 The crowd went wild when Beckham was announced out onto the field and whenever he was passed the ball. He was just as speedy with his feet and as handsome as expected. Everyone in the stands were wearing either a Beckham jersey or whatever soccer related shirt they could find. 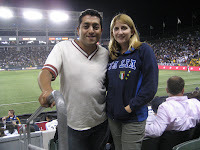 I had my Italia jacket on from Rome. They were playing the other Los Angeles team, Chivas, which means goat in Spanish. We had great seats in the lower level at the center of the field so we could see all the action. The stadium itself can hold 27,000 people and was super clean and new looking. They even had fireworks go off during the singing of the Star Spangled Banner. On a side note, I was surprised to see that every time a ball would get kicked into the stands, fans were forced to throw it back. In baseball you can at least keep the ball. The sellout 90 minute game ended in a tie at 1 to 1.